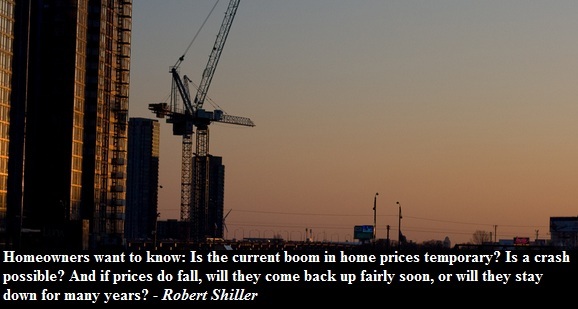 Do Real Home Prices Have a Substantial Long-Term Uptrend? Most of the housing reports that downplay the risk of a housing bubble in Canada tend to base their analysis on just a few decades of housing data. But if you are a homeowner who plans to occupy a dwelling for the next 30 to 40 years, then such data may not provide a definite answer on how real estate prices actually behave in the long run. If we look at the long term housing data (100 years +) then something unexpected emerges - in the long term, home prices tend to be rather flat. Below are long term real housing price indexes for Australia, Norway, United States and Canada. The chart below shows a long term housing index for Canada. Home prices in Canada behaved just like the US until the late '80s. I don't know about you, but to me the graph above suggests that Canada has a housing bubble.